Morris wrote his book, “Gumbo Warrior a Guided Step-By-Step Recipe of a True Leader,” in 2018 and was inspired by Marines he guided, family members, experiences as a food service Marine, and hardships. “There are many prolific writers and scholars who look for recognition, however Morris writes from the heart and expresses his professional and personal experiences in his own words. Today, rarely does someone express their soul with a pen,” said Gregory C. Brown, a retired master gunnery sergeant, who wrote the forward for this book and was one of Morris’ mentors. In his efforts to establish a legacy, Morris wrote his book in honor of his children, hoping one day they could look back on his success as a Marine, a leader, and most importantly a human being. Marines from his past and present continue to look to Morris for guidance and mentorship as he climbs the ranks, gaining knowledge of himself and others every day. “I wanted to write this book as a capture of time and as a voice for the enlisted Marine.” said Morris. Recognizing the majority of books written in regard to military leadership were authored by retired Marines and officers, Morris believed it was important to write this book as an active-duty enlisted Marine for active-duty enlisted Marines. Something they could relate to and would help them grow. As suggested by his father, Morris began his journey as an enlisted Marine with an open contract. His Military Occupational Specialty would be chosen according to the needs of the Marine Corps upon his graduation of Marine Combat Training. As Marines gathered to learn of their MOS selection, Morris joked with his fellow peers about being chosen as a food service Marine. To his dismay it’s exactly what he received. His grandfather was a cook for the Army and his father was a sous chef for many years. He grew up surrounded by the passion and art of cooking alongside his two grandmothers in his hometown of New Orleans where he spent a lot of time in the kitchen. 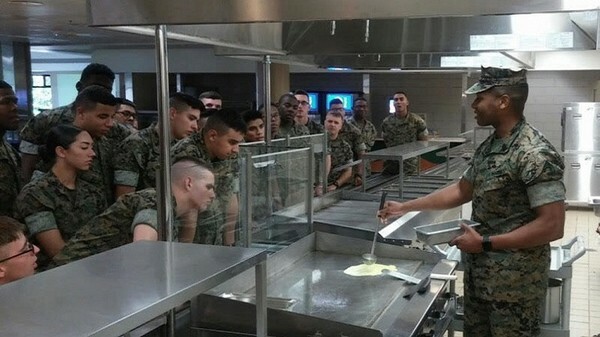 Although the young Marine recognized his assignment as fate, he had an unfavorable preconceived notion of what it would be like to be food service Marine. Gunnery Sgt. Juan Delvalle, an instructor at the Quartermaster Center and School where food-service Marines learn their craft, immediately shattered these expectations and would soon become one of the young Marine’s most impactful mentors. “He made a major impact on me. I noticed that he was dressed real sharp – he looked like a poster boy Marine,” Morris said. Along his journey at MOS school, many of the fundamentals of his job began to grow on him. He used what he watched and learned in his grandmothers’ kitchen as a young child to flourish and become proficient in his job. He loved that to make an impact he didn’t have to say anything – all he had to do was perform. Morris is a firm believer food brings people together, and people of all ranks and walks of life feel much more comfortable in a food-based setting. “Everyone comes to the table to eat. That’s what this book is all about” he said. Later in Morris’s career, he found himself at the school house once again – this time as an instructor. There he made a major impact on his Marines who would carry his motivation throughout their careers. “This guy is a legend in my life. If we were ever down, he would come in and give this speech that would just change your life. He instructed us as he would his own family; I looked at him as a father figure. His motivation does not die out,” said Sgt. Pauliasi Tamale, regimental assistant mess chief, 11th Marine Regiment, 1st Marine Division.